Meet Zozat, a young Zirr from a distant planet. The Zirr are an insectoid race, loyal servants of their Empire and their Emperor, and frequent foes of Astro City’s heroic First Family. 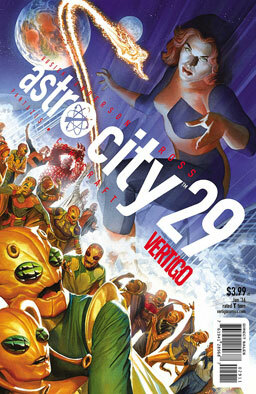 But this isn’t your typical superhero story, where the evil bug aliens invade Earth and are beaten back by noble heroes. This is a story about a mostly peaceful race of people who are definitely alien in form and thought — but more human than they (or we) would probably be comfortable acknowledging. Zozat is the school prodigy on his last day of school, excited to see his older sister back home from the military academy. But the Zirr military have captured an unpowered member of the First Family, and that means there’s about to be an invasion of hostile aliens from across the galaxy! Will this be the battle that finally allows the Zirr Empire to destroy the Earthlings once and for all? Verdict: Thumbs up. It’s hard to say that the story really humanizes the Zirr — it’s more accurate to say that it alienizes them. The Zirr are really weird, and their language is bizarre, and their customs and mindset are inhuman. But they’re still a lot like us. They love their families, they play, they fight, they dream, they get propagandized by their media and government, they question, and they’re certain they must be the greatest species the universe has ever seen. They’re emphatically not like us; they’re also emphatically a lot like us after all — and this makes for a really wonderful comic book. The Skrulls are a dying race, but they see hope if they can summon their true king, a Kree/Skrull hybrid, from Earth. 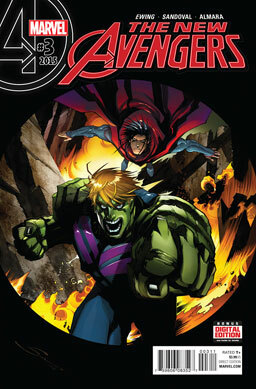 Oh, wait, they’re talking about Hulkling, aren’t they? And speaking of Earth, the New Avengers are getting settled into their new digs on Avengers Island. Power Man is questioning whether Wiccan’s name is really appropriate when he’s not a practitioner of Wicca; Pod is being made to confront its/her uncomfortable dual nature; Songbird and Roberto Da Costa have just discovered there’s a mole other than Hawkeye on the team. And then the giant Skrull warship decloaks and attacks everyone. Verdict: Thumbs up. Fun art, decent story, cthulhoid monsters, surprisingly apt discussions of cultural co-option in the superhero community, and some wonderful and fun bits of dialogue.